Hail, Paraskevi, O comely virgin. O chaste Paraskevi, martyr of Christ, O chaste Paraskevi, martyr of Christ. Hail, dear throne of God. Hail, pure servant of the Virgin. Hail, you who cease the tears and groans of mortals. Hail, for you rejoiced in the monastic path. Hail, you who were victorious through Christ’s power. Hail, speedy healer of wounds. Being the root from the divine prayer of your parents, Agathon and Politia watered you with the streams of piety. And you, O comely Virgin, flourished as a tree, as those who gave birth to you rejoiced in your grace, and chanted to the Lord: Alleluia. Hail, our most beloved righteous one. Hail, heroism and worth of the calling. Hail, boast and seal of the angelic life. Hail, the ceasing of idol worship. You were not at all conquered by the glories of this life, O pure Christ-bearer Paraskevi, but taking hope in the life above, you perceived the things of life as refuse joyfully, and were enriched with divine things, and cried out to God in fervor: Alleluia. Hail, soul of godly monasticism. Hail, you who bestow grace on monastics. Hail, you who possess incorruptible treasuries in the Heavens. Hail, for you dissipate the cloud of error. Hail, lamp which shines with light of purity. Hail, rays of the supernatural life. Being zealous for the things of Heaven, you locked yourself in a Convent, O most noble champion Paraskevi, for you submitted your wise mind, and joyfully struggled with ascetical pains, worshiping the Lord, and crying out with bitter hymns: Alleluia. Hail, harp of divine knowledge. Hail, you who spoke with the spotless Angels. Hail, protection and foundation of those who honor you with faith. Hail, you who were made worthy of the honor of the age to come. Hail, salve for our eyes. Hail, breath of unsleeping worship. You walked the God-traced path of the Apostles, as another Protomartyr Thekla, and passed through the land of the Romans, and the cities of the Greeks, as an all-precious doe, preaching Christ fervently, and crying out with longing: Alleluia. Hail, for your fragrance was as pure nard (John 12:3). Hail, sweetest apostle of the Savior. Hail, for you imparted your experience to ascetics. Hail, for you are the protector of those endangered. Hail, disappearance of the false gods. Hail, reproach of the evil heart. Demonic waves and unbearable blows, you endured, O much-suffering Lady, for the tyrants sought to burn you, and to break the chain of your faith, but you stood as an unshakable divine statue of Christ, saying: Alleluia. Hail, our map and canon. Hail, you who shattered the faces of idols. Hail, all-fragrant rose, and seal of the soul. Hail, for you also trouble the swarms of the demons. Hail, chosen ode of the God of all. Hail, protector of every town and place. Dwelling, as Paul, in prison alone, you were made worthy of the vision of an Angel, who showed you the honored symbols of the passion of Christ, in order to give you courage, O all-wise one, that we might cry unto the ages: Alleluia. Hail, key of uncreated gifts. Hail, for you were steadfast manfully as you were being raked. Hail, Martyr who also shelters desert ascetics. Hail, for you were divinely kept unharmed. Hail, you who grant light to the blind. Hail, through whom magic has disappeared. 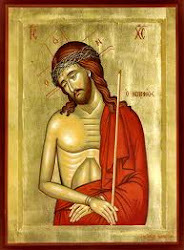 You were tortured mercilessly, and brutally hung, without your steadfast mind wavering at all, but you cried out to the tyrant: Christ can deliver me from any of your tortures, to Whom I chant fearlessly: Alleluia. Hail, for you preached the Sun of love. Hail, purest eye that looks against the enemies. Hail, you who conquers the opposing swarms. Hail, soul arrayed in light. Hail, fragrance to men from Heaven. Before your end, they placed a heavy stone upon your chest, O Martyr Paraskevi, while Jesus appeared to you at night, surrounded by light and the radiant ranks of the Angels, and totally healed you. Thus you cried in joy: Alleluia. Hail, you who were victorious in beatings and asceticism. Hail, meekness of spirit, and giver of peace. Hail, for you are the intercessor to the Trinity. Hail, deliverer from sinister spirits. Hail, you through whom the governor was astounded. You were worthily granted from Heaven an incorruptible crown, O lady, and the grace of wonders, which were founded upon your virtues, and your many struggles and terrible tortures, from which you blossomed forth and were glorified, as your fellow struggles cried out: Alleluia. Hail, divine stream of wonders. Hail, plantress of rose-beds of monastics. Hail, dew of Hermon that burns up dangers. Hail, for your hand heals those in pain. Hail, providence that you give to the poor. Hail, flower of joyous fragrance. Water of incorruption is your Holy Water, O Mother, which heals ever sickness. 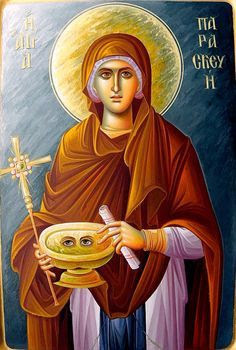 Therefore, we who praise you, hasten to your protection, O Paraskevi, entreating for purification of soul, for those who ceaselessly cry to you: Alleluia. Hail trauma of the demons. Hail, guide of catechesis of the faithful. Hail, for you were hung from a peg by your hair. Hail, you who bore the weight from the evil doers. Hail, all-wondrous one among apostles. Hail, firewood that accepted burnings. Rejoicing with good cheer, you entered the Bridal Chamber above, O sacred martyr, and fell at the feet of Christ, which you embraced fervently, O all-precious Paraskevi. He placed a crown upon your head, and you cried out: Alleluia. Hail, shield of those who bear your name. Hail, you who drove back the Germans. Hail, Martyr who makes the desires of the Bridal chamber disappear. Hail, for you deliver from the chaos of the faithless through your intercessions. Hail, terror to the demons. Hail, you who are the protection of those who hymn you. O divine nun, great prize of pious virgins to the Most-high (3) receive this as wild flowers, which we have gathered for you simply, and entreat the divine Trinity for salvation of those who cry with you: Alleluia. Αναρτήθηκε από amphilochios στις 2:13 μ.μ.